Just like dogs, cats can be afflicted with mange, but thankfully it is far less common. The most severe form of this problem will leave your pet practically hairless and with terribly irritated skin. While mange is more often seen in stray animals, cat owners should be aware of the symptoms so that they can seek help for their cats before the condition ever gets that extreme. Scott Gavaletz, a veterinarian and owner of Branford Veterinary Hospital in Branford, Connecticut, describes mange in cats as “the single most itchy disease a cat can get.” That description alone should motivate any cat owner to do what they can to keep mange from affecting their pets. Mange is another name for a mite infestation. The two most common types of mange are due to Demodex cati (black mange) and Scabies Sarcoptes (red mange) mites. These mites burrow under the skin causing the extreme itching and subsequent hair loss on a cat. Demodex cati is found on all cats, but in immunocompromised cats, the mites may become overpopulated and cause a problem. According to the Companion Animal Parasite Council, this overgrowth can be associated with an underlying systemic disease. It is typically only seen on young kittens and older cats. Demodex is not considered to be contagious. Scabies Sarcoptes is less commonly seen than Demodex cati and may be acquired if a cat comes in contact with wildlife or other animals who have an infestation of mites. This is why cats living in colonies outdoors may be more susceptible to mange than a house cat. Scabies are very contagious mites to both animals and people, so they are also a human health concern. Cheyletiella is another type of mite, often referred to as walking dandruff. These mites live on the outer layer of the skin rather than underneath it. Cheyletiella is most often seen in rabbits but it can also be a problem for cats. Finally, ear mites may be referred to as otodectic mange. Otodectes cynotis infest the ears of cats, where they cause itching and inflammation. These are very commonly seen in cats but most people do not call them mange. Some symptoms of mange are similar to those of a flea infestation. Itching, skin redness, hair loss, skin dryness, swelling and excessive licking or grooming can all be symptoms of mange in a cat. These symptoms will also cause some restlessness, irritability, and soreness. Symptoms can occur about one week after exposure and will worsen if the mange is not treated. 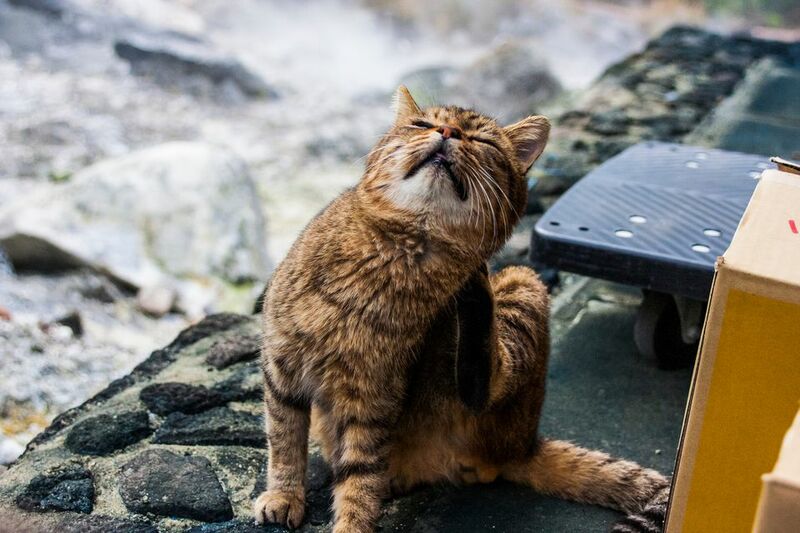 Scabies, ear mites, and walking dandruff are all contagious, so if a cat is in close proximity with an animal that has one of these forms of mange, they will also become infested. Since Scabies is also zoonotic, it can be transmitted back and forth from a cat to a human and vice versa. Cats that are immunocompromised may be more susceptible to an overgrowth of Demodex. Diagnosis of mange is made by observing the mites under a microscope. Scabies and Demodex can be found by performing a skin scraping since they burrow under the skin, but Cheyletiella and Otodectes can be swabbed out of the ear using a cotton swab. Under a microscope, Demodex cati are cigar-shaped mites with stubby little legs, Scabies Sarcoptes, Cheyletiella, and Otodectes are oval-shaped with multiple legs. Your veterinarian will be able to diagnose the type of mites in your cat. Depending on the type of mite your cat has, the treatment regimen will vary. Medicated dips and shampoos, topical medications, and injectable drugs may all be prescribed. Depending on which mites are found, how severe the infestation is, and whether or not your cat has secondary symptoms will dictate which treatment plan is used. Sometimes simple soothing shampoos and sprays will be used to relieve the itching. Most healthy house cats are able to resist an infestation of mites since they are not immunocompromised, but just like flea control, a clean environment is still important in helping to prevent your cat from getting mange. Some basic things you can do to help prevent mange in your cat include washing its bedding in hot water with detergent and vacuuming the house regularly. These seemingly obvious things will help keep your cat’s environment clean. If you are exposed to cats that are not your own, either through rescue work, working in a facility that has cats, or through petting outdoor cats, you’ll also want to make sure you wash your hands before handling your own cat. Even though mange is a nasty parasite that cats may be vulnerable to, the good news is that the typical housecat, who is healthy, living in a clean indoor home and fed a quality diet, should never experience this disease. What are Tapeworms in Cats and How Do You Treat Them?